New research has revealed the 15 firms which snagged the biggest and the most deals in the Australasian region in 2016. 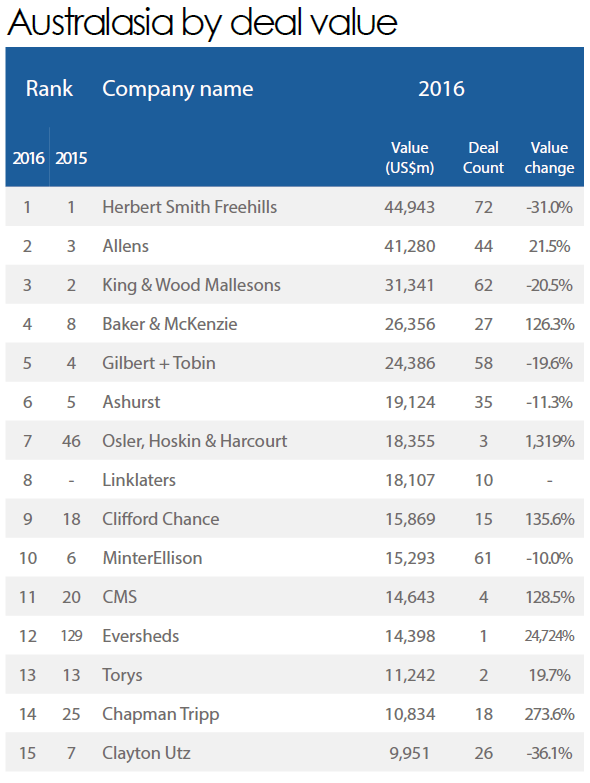 According to Mergermarket’s Global and regional M&A: Q1-Q4 2016 league tables of legal advisors, Herbert Smith Freehills leads in both aggregate value and total volume of deals. The firm advised on deals with a value of US$44.94 billion or about $60.84 billion across 72 deals. HSF also placed first in both Mergermarket league tables last year. In value, Allens placed second with deals worth US$41.28 or about $55.88 billion. 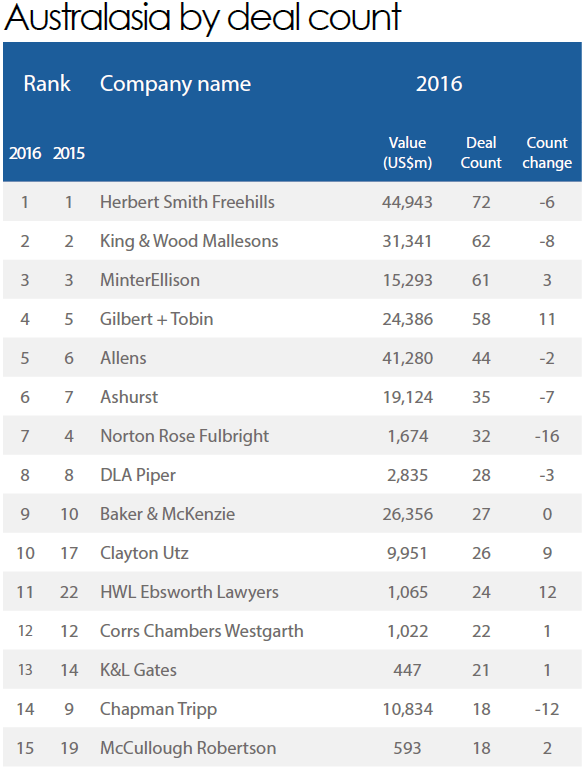 In volume, King & Wood Mallesons placed second with 62 deals. Allens placed third in deal value last year while KWM retains its second place in terms of deal volume from the previous year. KWM dropped a spot from 2015 in deal value, advising in 2016 on deals worth an aggregate US$31.341 billion or about $42.43 billion. Meanwhile, MinterEllison retained its third place podium finish in terms of deal count, advising on 61 deals worth US$15.29 billion or about $20.7 billion. Last year’s eight place finisher in terms of deal value, Baker McKenzie, is fourth this year with just 27 deals worth US$26.36 or about $35.68 billion. 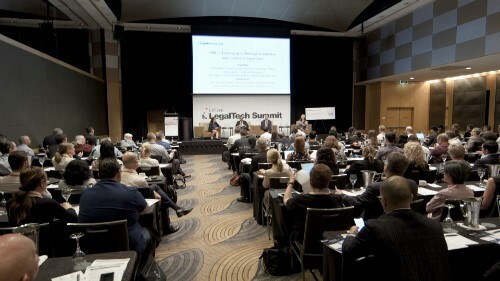 Gilbert + Tobin completes the top five, falling a place from last year, with 58 deals worth US$24.39 or about $33 billion. Those 58 deals land G+T the fourth spot in terms of deal count, a place higher than its performance last year. Allens is fifth in this league table with its 44 deals in 2016.